Sliced Fennel and onions are sautéed first then slowly cooked until they are caramelized to a toasty brown, finished with Parmesan, lemon, and Italian parsley. Heat olive oil and butter in a large, uncovered, heavy pan on medium high heat. Add the sliced fennel and onions and stir to coat. Stir occasionally, after 10 minutes sprinkle the vegetables with salt. Lower the temperature to medium. You want the pan hot enough to get the caramelization going but not so much that the fennel and onions dry out. If that does happen, add a tablespoon or two of water. Stir occasionally, scraping up any bits that are on the bottom. The brown bits are the ones with the most flavor. Cook for another 30 minutes or up to an hour, depending on how impatient you are. 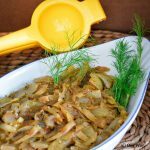 The longer it cooks the more caramelized the onions and fennel become. Taste test along the way. The dish will have a lot of flavor and doesn't have to be cooked down all the way. When ready to serve, remove the pan from the heat, add in the grated Parmesan cheese, the chopped parsley, lemon zest, and lemon juice. Sprinkle with slivered basil leaves, if desired. This is excellent served with chicken, seafood, or on crostini. I can't think of anything that I wouldn't serve with it.